To follow this tutorial, you need to have PHP and Laravel installed on your machine. When building web applications, it is not uncommon to find some sort of in-app notification system that will notify you instantly when someone carries out an action related to you or your account. On Facebook, you will be notified when someone likes your status, or when someone comments on your profile. We will replicate this feature by creating a web notifications system using Laravel and Pusher. Important Note: If you’re using the EU or AP Cluster, make sure to update the options array in your config/broadcasting.php config since Laravel defaults to using the US Server. You can use all the options the Pusher PHP Library supports. Open config/app.php and uncomment the App\Providers\BroadcastServiceProvider::class . 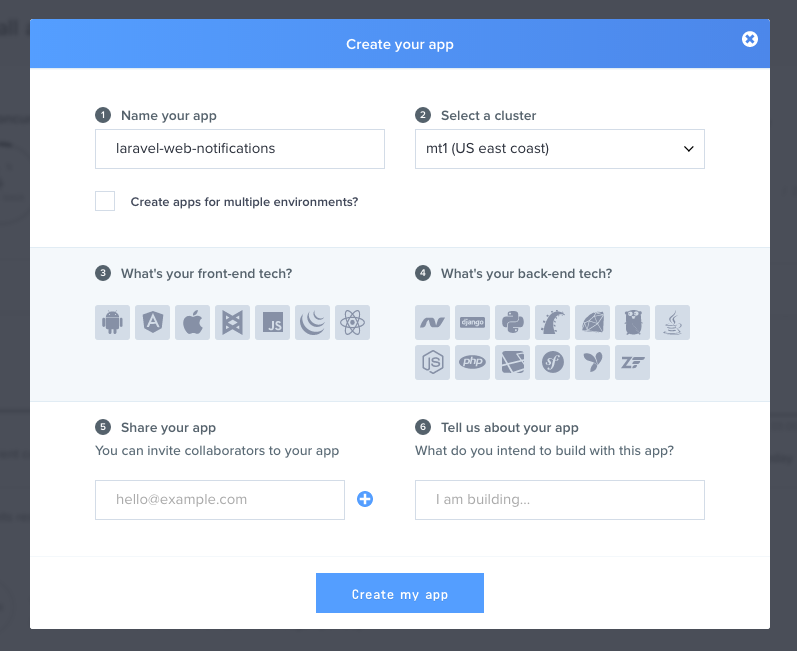 Now that we are done with configuration, let us create our application. First we would create an Event class that would broadcast to Pusher from our Laravel application. Events can be fired from anywhere in the application. Above, we have implemented the ShouldBroadcast interface and this tells Laravel that this event should be broadcasted using whatever driver we have set in the configuration file. We also have a constructor that accepts two parameters, username and verb. We will get back to this later on. We assigned these variables to class properties named the same way. It is important to set the visibility of the properties to public; if you don't, the property will be ignored. Lastly, we set the channel name to broadcast on. We will keep it simple and create a single view where you can see a navigation bar with a notification icon. The icon will be updated when new notifications are available without the need to refresh the page. The notifications are ephemeral in this tutorial by design; you can extend the functionality and make it last longer after the page reloads if you so desire. Open the welcome.blade.php file and replace it with the HTML below. The code above just initializes the Pusher JS library and subscribes to a channel. It then sets a callback to call when the event broadcasted is received on that channel. Now we can start a PHP server using Laravel so we can test our code to see if it works. In this article we have been able to leverage the power of Pusher to create a modern web notifications system and it was very easy. This is just scratching the surface of what can be really done using Pusher. The example was just to show you the possibilities. The code is available on GitHub, you can star, fork and play around with it.